Since 2009 in Russian Federation unified state examination became obligatory. The Ministry of education approved certification of the task and the criteria for their evaluation. But, as shown by statistics, not all graduates successfully pass the exam. As a rule, one of the main reasons of non-issuance of the certificate the graduate is its absence on the unified state exam. The Ministry of education of the Russian Federation every year develops the timing of the exam and job for him. If graduates are not on the exam at the prescribed time, it shall be considered that they didn't do that. There are cases when graduates of secondary schools cannot cope with examination tasks. To the exam was considered to be counted, you must score a minimum score, called the threshold. All the law in the official program of the unified state exam has two compulsory subjects: mathematics and Russian language. If a graduate could not get the required grade in one core subject, he is given another chance to correct their situation. With repeated failure to graduate is issued a certificate of enrollment in secondary school. In case when a graduate has failed to collect the required minimum score on the two core subjects, he is not getting a second chance, and immediately deprived certificate - and he is given a certificate of graduation. Except the reference of listening to the course 10-11th grade, graduate give "hands on" certificate of completion of nine grades. How does the information on education? Certificate of completion is issued to the 11 grades of secondary school, which is the graduate. This document indicates his personal data, full name of the institution and three marks: the annual, and final mark received on the state assessment. Instead of the third assessment sometimes indicates the number of points earned in the exam. Graduates who do not receive the certificate of secondary education, deprived of the opportunity to continue training in a higher educational institution. With the documents that are handed do not pass the exam can proceed only in technical schools and colleges on the basis of 9 classes. However, the chance to obtain a higher education of such graduates is still there. To the end of College or College to go to College on your profile, take the exam they will not have to. But in case when a graduate decides to go on another profile, he is obliged to pass the state certification and only by its results it will be able to start learning in the University. The loss of the documents is always an unpleasant event. The loss of the certificate about education is fraught with paperwork. The only plus is that at the moment the recovery school diplomas free. But for the certificates of secondary education will have to pay, so save your documents. In case of loss of school certificate you will need to come to the school where you studied and write a statement. The application must be addressed to the Director of the institution with a request to issue a new certificate to replace the lost. Then the school sends the request to the form of the certificate to the Department (management Committee) on education. By law, these forms must be paid from the city Treasury, but it is possible that local authorities could make changes. Find out about this in advance, not to be in an unpleasant situation. If you studied in another city, then you will need to submit written form of the statement of securities by registered letter with acknowledgment of receipt. Just keep in mind that school to send a certificate will not. You will have to pick up the certificate in person or to delegate familiar notarized power of attorney. If you lost your certificate in a vocational school, instead of a new diploma you can issue a certificate. The certificate shall provide the name of the trained and how long does the training. The statement must specify why you needed a diploma. The students of universities to help make the liner with the estimates. If you need a sure diploma, the duplicate will have to pay. If you need to restore the University diploma, you will need a certificate from the police about what you said about the missing diploma. This certificate accompanied by a statement addressed to the rector indicating the year of graduation. Then these documents are submitted to the personnel Department or the Secretariat. The school is obliged on request to issue a new diploma is lost. The diploma is written the inscription "duplicate , and the date of issue becomes the date of graduation. State universities and colleges, accredited charge not exceeding double the value of the form. In that case, if the diploma was issued in my maiden name, and you are already married, then the statement and police clearance certificate is attached copy of the marriage certificate. In spite of this the diploma will be written the old name. If the University where you studied, reorganized, you can contact the Department of education by the study. Information about your diploma is in a single computer database of issued certificates. Academic transcript – a document about incomplete secondary vocational or higher vocational education. It is issued to students who have completed the training before the end of the course and not passed the final state certification speciality. The results and obtaining academic certificates takes place at the faculty where the student studied. Regain school certificate or other document of previous education and other documents delivered to the admissions office against a receipt. For this visit her during working hours together with your passport and receipt. At the same time bring a student ID card, grade book and electronic student card. Write the Dean a letter to the Dean about the results of academic transcripts. Give the duty to the Secretary or other responsible officer of the Dean's office. Specify the production time of reference. At expiration again visit the Dean's office at the appointed time and take the help. Make sure it shows the correct data on the number of visited passed the test and your personal details: age, first name, middle name, last name, etc. The lack of such an important document like certificate entail a lot of problems in life. Make a new document will result in serious paperwork. But without the certificateand you will not be able to enroll in any school, and at work you also will not be accepted. If so happened that your passport have gone missing, it can be done again. If you lose the certificateand contact the school in which you studied, and who gave you this document. Apply to the Director with a request to make a new document. To restore the certificate will be about a month and do it absolutely free. If your school is in another city, you must send a registered letter with notification in the school decorated a statement and specify your contact phone number. Please note that the school has the right only to accept the application by mail, but has no right to send the recovered certificate. So you will need to personally pick him up from school. If you lost your diploma from College or trade school, the recovery process can take up to three months. The application form must specify the reason why you need the diploma. Keep in mind that this recovery is paid and you will need to pay for this service in the Bank and provide the payment receipt to the school. In the case of a lost diploma of higher educational establishment you should contact the local police station and write a statement about the missing document. The district needs to issue you a certificate of loss of the diploma. This certificate along with the request for reinstatement you must take the Director of your school. The process of recovery may last from two weeks to three months, depending on the range at the head of the University. The diploma is stamped with the words "duplicate" and corrected date of diploma date of recovery. A certificate called a document confirming the receipt of primary (General) secondary education (9 grades) or secondary (full) General education (11 classes). 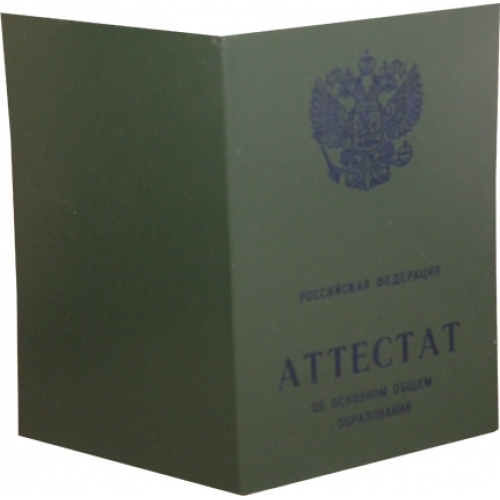 Undoubtedly, the certificate is considered to be one of the key documents for anyone, because secondary education in Russia is compulsory. In addition, admission to different educational institutions (colleges, Universities, vocational schools, colleges) is impossible without a diploma. But it happens that the certificate is lost and must be restored. 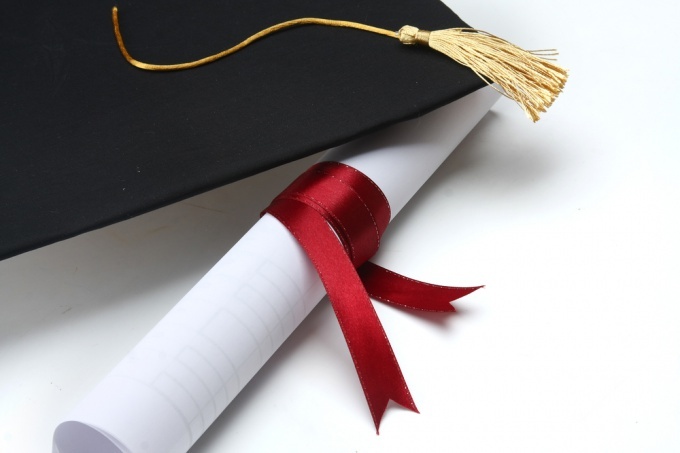 To restore a high school diploma you need to write the application addressed to the Director of the school, where he was received with a request to issue a new one instead of lost, but be sure to indicate the specific cause of the loss of the certificate. In that case, if this school is in another city, then you should send your application by registered letter with acknowledgment of receipt, however, you personally have to pick it up, or to authorize friends to do it with their consent via a notarized power of attorney. In turn, the school will ask the Department (Committee, Bureau) education the form of the certificate. These forms are, in principle, should be paid from the city Treasury, but it is possible that the local authorities decided otherwise. You will also need a copy of the certificate obtained from the police, or other documents which confirm the fact of loss (when these are absent, only one statement). If you need to restore the certificate about the average education and also to receive the certificate of incomplete higher education, when your documents at the end of the school was handed over to the Institute you studied there for a while, then dropped out, and the documents remained at the University, then you have to apply to the University because a certificate has a long shelf life and is in the archive of this Institute. Note that a duplicate certificate of basic General education are required to give three days, and the duplicate of the certificate of secondary (complete) General education within one month. Besides, all these documents are done free of charge. If schools that had obtained a certificate has already been closed, you must contact the Department of education of the district where this school was. The recovery certificate on the basis of the letter of the Ministry of education of the Russian Federation dated 16.04.2001 No. 14-52-235ин/13 "About certificates of secondary (complete) General education". It so happens that a high school diploma lost, significantly damaged, or you find a fault with it, which makes it impossible to use. In all these cases you have the right to obtain a duplicate of the document. This possibility is spelled out in the Order of the Ministry of education of the Russian Federation No. 143 of 02.04.1996 "On approval of the regulations on the procedure for storage, issue and accounting of documents of the state sample about the basic General and secondary (complete) General education". If a certificate is stolen or you lost it, be sure to sign the document confirming this fact. This can be a certificate issued by the body of internal Affairs (i.e. police), fire protection (if the loss occurred due to fire) or an ad in the newspaper. If it's only attached to the certificate, also take care of the evidence. Apply to a school that issued you the certificate. If a certificate or application is lost, the statement will present the circumstances of the loss and attach the documents confirming this fact (see claim 1). If a duplicate is necessary in connection with damage or a fault is detected, in the application, describe the nature and circumstances of the damage or specify the errors. In this case, you must return the certificate and/or the app because, by law, it must of unichtojiti with the observance of certain formalities. Then by making a duplicateand will be engaged in your educational institution. But you should know that if you change the name of the school, together with a duplicateof ω necessarily give out the document confirming the change. If there was a reorganization of the educational institution, so he has a successor, who is obliged to issue a duplicate. If the educational institution is liquidated, contact the district Executive authority, exercising administration in education sphere. This can be the Department of education or Department of education when the district administration. If the time elapsed since the issuance of the original certificate, lost of archived data with estimates, a duplicate certificate you will receive no applications. In case of loss of archived data that you really finished this educational institution, the issuance of a duplicateand is carried out on the basis of other evidence. For example, copies of certificate, original certificates, written evidence of at least three teachers who taught you in high school. Only in the complete absence of evidence of your learning, educational institution has the right to give refusal to issue a duplicate ofa certificate. A duplicate certificate or a reasoned refusal to issue a you are obliged to issue within one month from the date of submission of the application. Duplicates are issued on the letterhead sample, which is valid for the period of application about issue of the duplicate, regardless of when the educational institution was completed. Every graduate knows that without the certificate on average the education is impossible to do in high school. Therefore, we must do everything possible to avoid unsatisfactory grades per academic year. In addition, they must pass the exam. The first condition for obtaining a high school diploma is the end of the school year, no unsatisfactory ratings. If you have debt on any subject, do not delay subsequent to the end of the year. Come systematically to the teacher for advice. Usually teachers assign on a certain day of the week time to correct estimates. Take time to laboratory and test work. Agree with the teacher in case of poor result. Do not skip classes without a good reason. Be sure to ask the classmates about what was learned in the lesson and do homework. If you have in the class, who is well versed in a particular subject, ask him to explain complex material. Learn to understand difficult assignments, do not write them thoughtlessly. In the case of an existing unsatisfactory grade, pay him special attention in the next quarter, since there is a probability of getting her in a year. Arrive on time for lessons, not konfliktuete with teachers and especially with the administration of the institution, if you want people to go meet you in a difficult situation. Once you will finish the year without the two, you need to pass the exam. Keep in mind that after the exam day three or four, Rosobrnadzor announces the minimum threshold. If you don't overcome, the exam for this subject is considered undelivered. 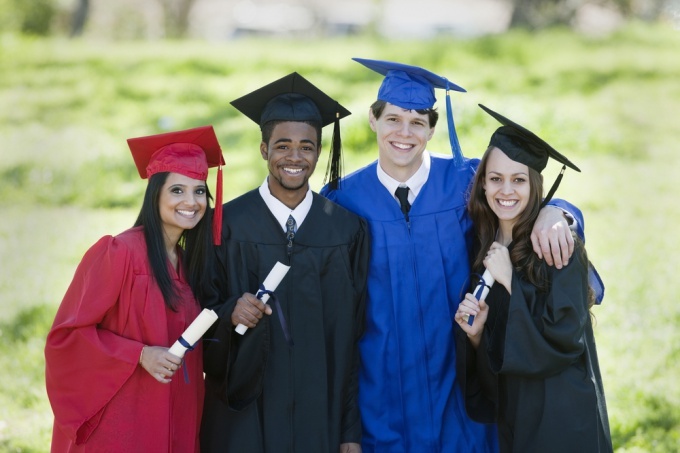 Graduates typically pass the exam on three or four academic disciplines. And in Russian language and mathematics to take the exam should all graduates, while the other objects - the choice of the student. If you are not able to overcome the minimum threshold on one of obligatory subject matter, you will have the opportunity to retake it in reserve days. About them will tell you the teachers at the school. If you can not cope with the tasks and math and the Russian language, repeated attempts this year you will be gone. It will appear only next year. And only then will you be able to obtain a high school diploma. If you're a responsible attitude to learning, well prepared for the exam, you will be able without much trouble to obtain a high school diploma. Certificate – a document about the total or average education full. Issued to the graduate at graduation: after the ninth and eleventh classes. This document is required not only for admission to professional educational institutions, but often to provide the work. So at the end of Profsafety do not throw your passport - you never know. If the document on education after all is lost, you can restore it only to the school that issued the original. Start to give an ad in the local media: just one newspaper. Usually the proposed revised text, as follows: "the Certificate about average full education, No. 123456, issued June 25, 2005 in the name of Ivanov Ivan Ivanovich, is to be considered invalid, in connection with the loss of the original of this document. Wait for release of this material in the world to stock up on one such instance. Further, by providing the newspaper with the published announcement in the internal Affairs bodies, write a statement (ibid), the loss of the document on education. 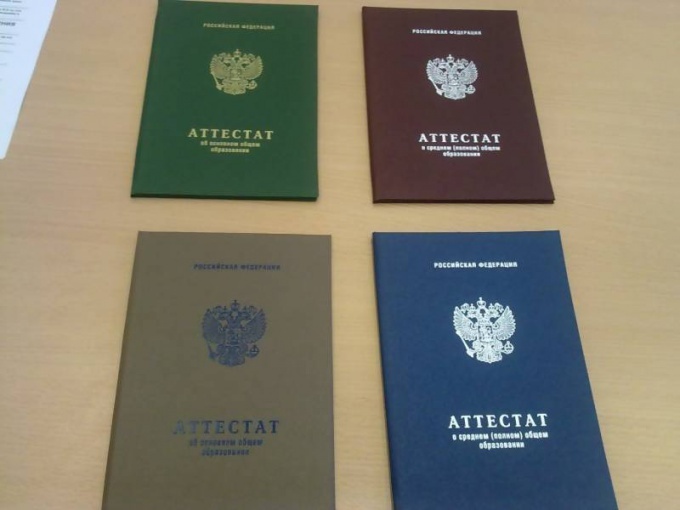 At the police station the person who has lost the document needs to issue a statement on the refusal of institution of criminal proceedings, due to insufficient amount of material. Then with these documents (paper and help) go to the school which has issued the certificate. Write a statement of request to issue a duplicate of the document where you specify the cause of the loss of the certificate (burned, drowned, lost, torn, etc.). The school will take a copy of or extract from the book of issuing certificates, with the specified issue date, series, number and progress of graduate, lost documents. 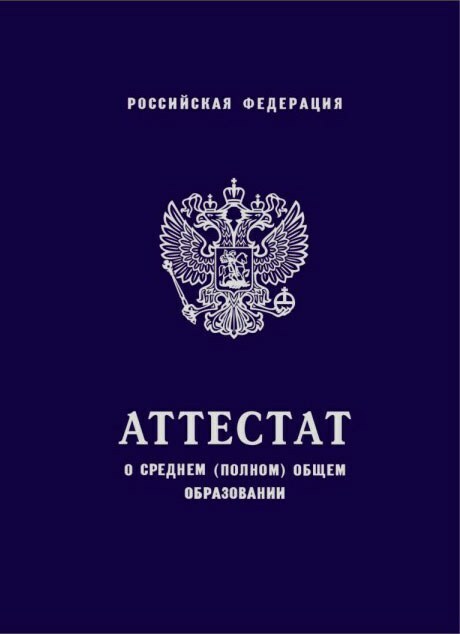 Then, visit the Department of education, with a beginning over the school that issued the lost passport where you provide all the documents received earlier, be sure to confirm the identity of the passport of the person who needs a duplicate of the document on education (as a rule, this is done in person). The Deputy chief of Management of education will contact the school principal, to transmit pure Blanca new passport at school. After one or two days school will fill out a duplicate of the document (according to the book of issuing certificates and will issue under the signature of the graduate. 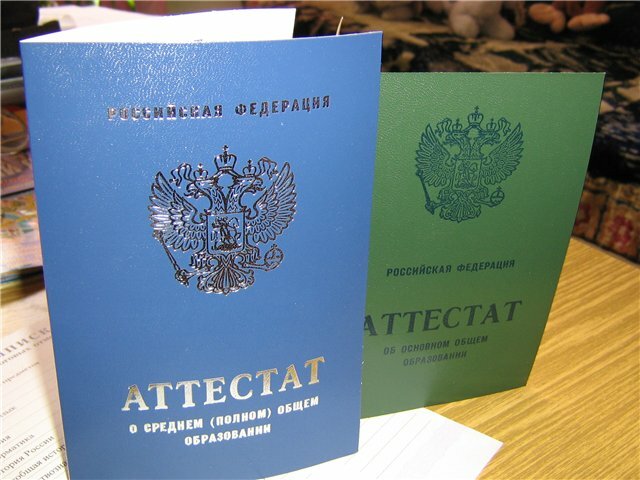 A duplicate of the document on education can have a new form, color and other external characteristics, as the old samples of unused certificates are destroyed. And over time, the design of the certificates is converted, in connection with the updating of typographic technologies. If unable to repair number and series of the certificate in media publications, you can first go to school and get there a copy of the book of issuance of certificates. Documents should not lose, but nothing offensive if no one is safe. In case of loss will have to thoroughly run the chain of command and stand in queues to get the coveted crust. If there is no school certificate, it is not that difficult. To get started go to the school that issued you the certificate. Write the application addressed to the headmaster with a request to issue a duplicate instead of the lost document indicating the circumstances of loss. But if your school for some reason now does not exist, have to go to the regional Department of education. Sometimes in school a duplicate issue immediately refuse, and you have to write a statement to the police. In this case, go to the police Department in your area or one in which was supposedly lost document. Write a statement about the loss, indicating series, number and date of issuance of the certificate. And don't forget to take help of application. At the same time give the ad in a major city newspaper "Certificate №... in the name of .... to be considered invalid. In some regions you will certainly require. After that, feel free to go to school and write a statement. If you now live in another city, send a statement by registered post by registered mail. Just be aware that the document you via email no one will send. Will have to go yourself or outsource it to someone from friends living in this city. In this case, you must issue a notarized power of attorney for the recipient. If your name is different now, the statement you need to attach a document, based on which you changed the name. But the certificate you will still be issued with the same name. The General certificate of (General) secondary education you must recover for 3 days, and the certificate of complete secondary education in a month. Although in reality time can pass much more. Money will not take the replacement high school diploma free by law. But if you lost the diploma school, College, or University - would have to fork out. If you lost the diploma about higher education, it can become an obstacle when applying for a good job. To avoid this, you have gathered all the necessary documents as quickly as possible to engage in its recovery. With the loss of a diploma of higher education first need to come to the district police station. Here you should provide information about what you said about the loss of the diploma and investigative work have not given results. With this certificate and a passport you should contact the school where you received a diploma, to write the application about issuance of a duplicate diploma to the rector, specifying the period of your study at this University, year of graduation, faculty and specialty. In addition, you will have to pay the state fee. If you got the diploma in my maiden name, and at the moment have time to change, police clearance certificate and the application should attach a copy of your certificate of marriage. However, the diploma will remain your old name. If for any reason fill in the diploma Supplement becomes impossible, the duplicate diploma shall be issued without application. If you lost the diploma and the Annex thereto issued prior to June 22, 1996, you will be given a copy of the diploma and enclosure to the updated forms. 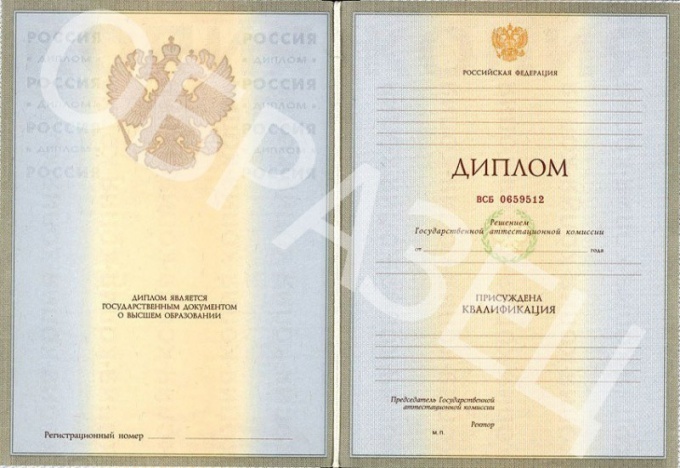 If the diploma you received after 22 июня1996, instead get a duplicate of the diploma Supplement, which should contain registration number of the surviving diploma. 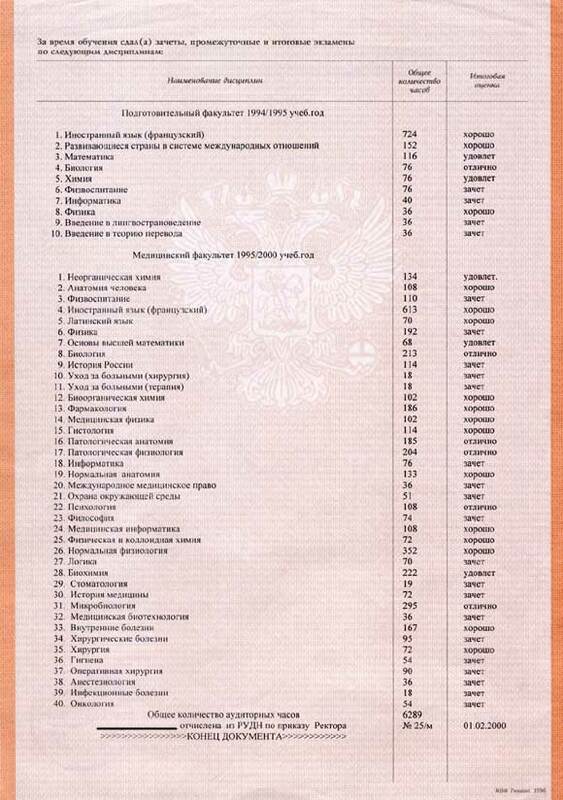 If the document on higher education issued before 22 июня1996, instead of a duplicate application is given an extract from the working curriculum on which the student graduated, with the obligatory indication of the period of study and of subjects studied. If the diploma was obtained after June 22, 1996, then issued a duplicate of the diploma and its annexes, and preserved the original of the Annex shall be disposed of. The restoration of the diploma of higher education usually takes a long time – from one month to six months, especially if he lost in the spring, during final exams. Academic transcript – a document on incomplete higher or secondary vocational education. It is issued to students who enrol on further education in another school or those who have not finished education before it was due. Application for issuing academic transcripts. The academic certificate is issued in two cases – at the request of the student or by the decision of the dismissal of the student. The latter is the case when a student violates the discipline of the institution, delay of payment or bad time for academic subjects. In this situation, the certificate is issued is mandatory, except when a student is expelled until the end of the first semester, and he has not passed the intermediate attestation in the first half. In the academic certificate usually contains information about the document submitted for admission to the educational institution, year of entry and graduation, education. As well as the specialty of the student, his specialization and a list of commissioned papers. The mandatory data are the list of subjects studied, number of hours under each of them and evaluating in these subjects. The help may be displayed as the results of entrance examinations or interviews. To obtain such a document on their own, write an application addressed to the rector of the institution with a request to issue an academic reference. Then take the application to the Dean's office. And after the due date, come and get help. It must be signed by the rector or head of the institution and sealed. Be sure to check your personal details and marks for the studied discipline. On the basis of academic transcripts you can transfer to another Department or a new school, enroll on a second parallel education in another University or continue education after some time. According to the information at the new University doing a reconciliation of the difference of hours and credit transfer objects, if the number of learner hours coincide with their number in the new institution.